TL;DR If you have a MacBook Air and really need the expansion, this dock will make your life so much easier. Otherwise, it’s probably too expensive to justify. Since this time last year, I've been the happy owner of an 11" MacBook Air. I have a Mac Pro networked in the other room to provide raw grunt and storage, but my Air has long since become my primary machine. It's rigid and lightweight, has excellent battery life even after a year of heavy usage, and the keyboard is decent. For those who claim you can't get any serious work done on such a computer, I point to my use of Final Cut Pro and running several VMware vSphere private clouds on it as proof to the contrary. I could get something more souped up (I do admit to lusting over those retina screens), but this machine suits my use case as a mobile IT professional and student so damn well, for the time being I see no need to upgrade. I'm thoroughly thankful for what I have. Unsurprisingly, the one area where I've struggled with it is ports. Until a few days ago, I couldn't have Gigabit Ethernet or my external display plugged in concurrently, given they both use the lone Thunderbolt port. A powered USB 2.0 hub offered some respite for the lack of those ports, but that still took up one of the two ports. I could get a Gigabit Ethernet USB 2.0 adaptor from Apple, but they operate at much lower theoretical speeds. Third party USB 3.0 Gigabit Ethernet adaptors are available, but seem to be flaky for many people and it would take up my last remaining USB port. There had to be a better way for me to keep using this otherwise excellent machine, but with the external expansion I need. You can see where this is going. 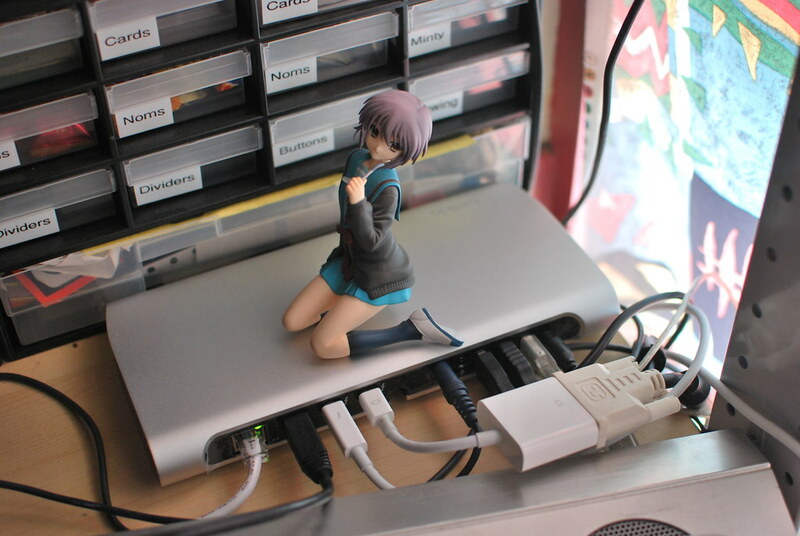 Over Christmas, I was super excited to have been gifted a Belkin Thunderbolt Dock by my very generous sister Elke. I hadn't been able to justify the expense myself initially, but now that I've been using it for a couple of days I can't believe I struggled for a whole year before deciding to get one! I'm using all these ports right now for networking, my Thunderbolt to DVI adaptor for my display, an external FireWire 800 drive, my keyboard and mouse, my speakers and my USB headset. Whereas previously coming home entailed plugging in a spaghetti mess of cables and deciding which devices to leave out, now I can have a full buffet by just plugging in one Thunderbolt cable. This fact alone has had such a profound effect on the quality of my life, I'm almost ashamed to admit it. But I'm not, because it's made me happy, so there. For my use case, it works perfectly. When I'm on the go for most of the day, I have a tiny MacBook Air. When I get home, I have everything else. Its as if my laptop has two parts, with the components not needed for mobile work never contributing to the weight of the primary device. The device has a hulking huge power brick that weighs more than the power supply for any of my Mac laptops and takes up almost as much desk space. If you're intending to use it as a portable expansion device, it utterly negates any weight benefit to having a MacBook Air, and then some. It'll never be leaving my desk, so that point doesn't bother me. Additionally, if you're intending to use this to modernise an older Mac, you'll also be limited by the half-speed of the USB 3.0 ports on the dock. Again for my needs, I'm using it as a docking station for my keyboard, mouse and headset so this also isn't an issue. What was incredibly disappointing however was the lack of a necessary Thunderbolt cable. In a tip of the hat to toy makers who don't include batteries for Christmas, this meant I had to wait till we could go out to an Apple store to purchase a cable to use it. Regardless of whether licensing or marketing were issues, it's pretty poor form for a device that expensive to not come with the cable needed to even use it. While we're on the subject, at around $300 some have said the device is overpriced. Granted, its easier for me to talk about this given I got this as a Christmas gift. Still, it comes down to a question of utility; if you intend to only use a subset of its ports, then perhaps for your use case it is overpriced. If on the other hand you're buying this to extend the usefulness of your primary workstation, I think it could be justified. Certainly having used this one for the last few days, I could see myself purchasing one for myself in an instant. Overall, is a form of clothing. And I'm unreasonably happy to have this dock.